Once done remove from the oven and let it cool. Heat 2-3 tsp oil or butter in a sauce pan, add almonds & onion saute nicely till light golden brown. Then add peeled and chopped tomato and saute till it turns soft. Now add roasted beets, cumin powder, some ground pepper and give a nice stir. And then add veg or chicken broth, enough salt, one bay leaf, parsley and bring it to boil. Once it started boiling and the veggies are soft and cooked, remove bay leaf and mash the content using immersion blender or allow to cool for a while and grind beets,onion, almond mix and retain the liquid/stock. 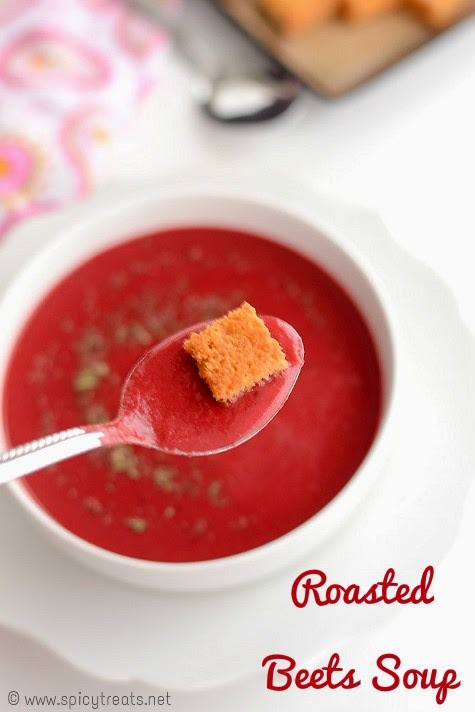 Blend it to a smooth puree and add it back to the pan, add the retained broth. check for salt and seasoning. Add some more ground pepper and Let it simmer for one boil and turn off the stove. 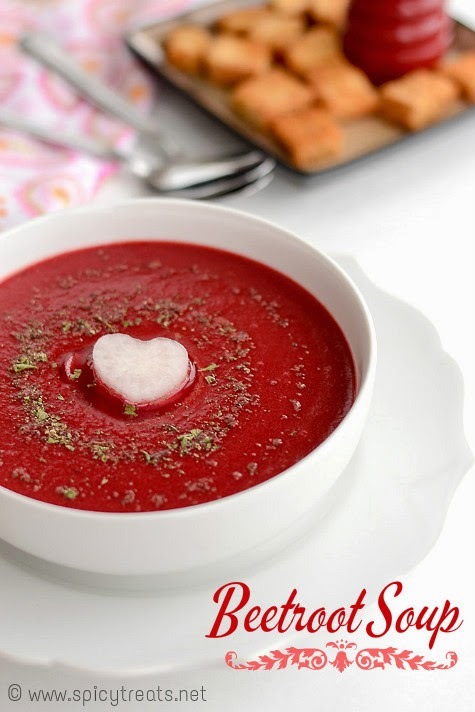 That's it..Healthy, delicious and creamy Beetroot soup ready. Instead of oven roasted beets, you can simply use chopped beets. 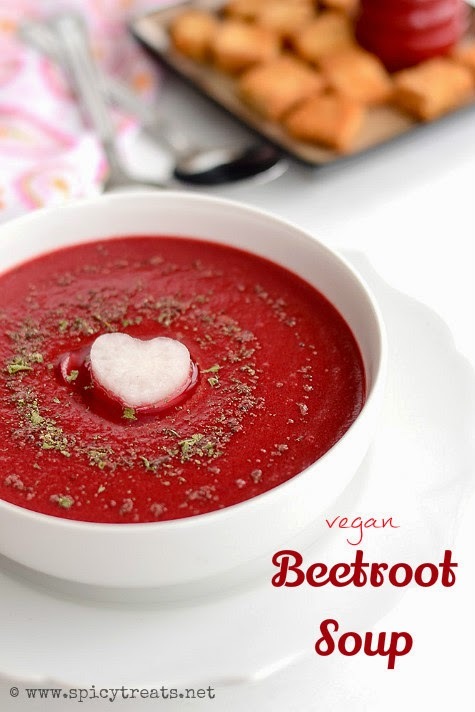 You can also steam cook beets to reduce the cooking time. I added extra ground pepper and it was perfect to balance the sweet taste of beets. You can use water or chicken or meat stock to make soup. If don't parsley simply skip it and add some cilantro. You can also add some sliced carrot to the soup. 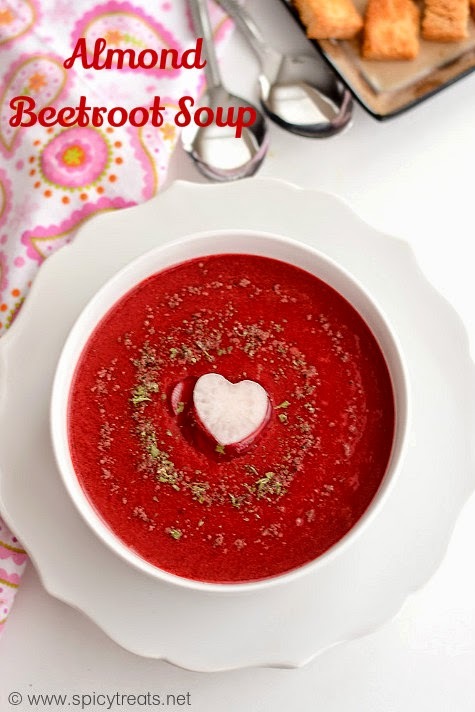 A very healthy and eye catching soup...I just couldn't take my eyes off them! Looks absolutely delicious!!! Hats off to your innovation! 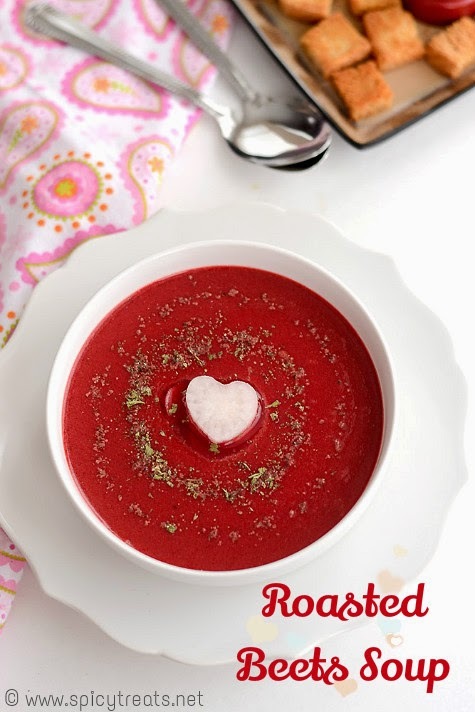 Love that little heart, so cute:) is that radish?? thanks for letting me know..will link up! Healthy soup passing loads of warmth along us here in this cold. Looks gorgeous! 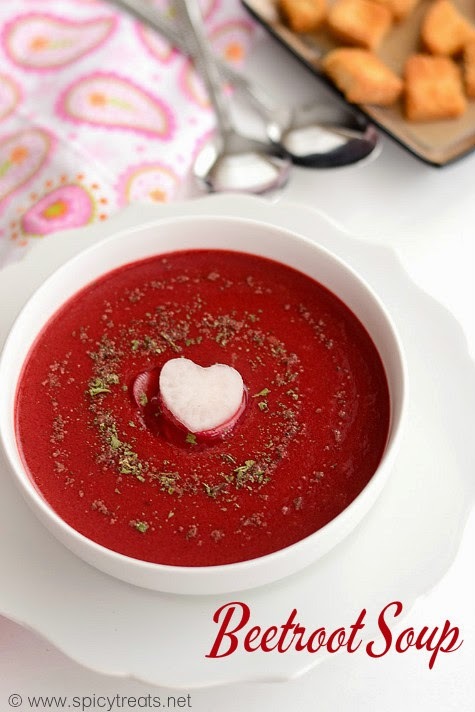 Excellent and lovely looking soup. Excellent pics as well.